A balanced lifestyle involves shifting priorities and adopting healthier habits. For seniors receiving Harrisburg, PA, live-in care, the changes they make can go a long way toward enhancing and extending their lives. Here are just a few of the benefits your elderly loved one stands to gain from taking a balanced approach to life. Seniors who have difficulty gaining or losing weight may quickly discover eating a balanced diet transforms their physical health. Choosing to eat nutritiously is one of the easiest changes your loved one can make toward living a more balanced lifestyle, and it pays off tremendously by ensuring he or she gets important nutrients. Over time, the combination of a healthy diet and daily exercise can help your loved one manage his or her weight and maintain his or her strength. Adopting healthier lifestyle practices boosts the immune system and eliminates habits that contribute to disease. For example, decreasing stress levels and increasing daily physical activity can help your loved one prevent heart disease and strokes. Seniors who are physically and mentally healthy also experience faster recovery times if they do get ill.
During the senior years, cognitive health can be a serious concern. 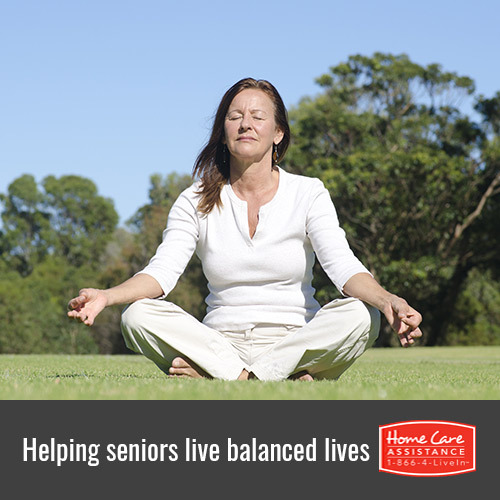 However, adopting a balanced lifestyle can prevent age-related memory loss. This is because seniors who take the time to stimulate their minds often retain their cognitive abilities. Additionally, exercise increases blood flow to the brain, and a nutritious diet provides the essential vitamins your loved one needs to think clearly. A balanced lifestyle should also include opportunities for relaxation and socialization. Seniors who have a strong social network enjoy better emotional health since they have a source of support during times of stress. Socializing can also give your loved one a sense of purpose, and engaging in creative and relaxing hobbies provides the stimulation he or she needs to stay emotionally strong. Striving for balance in life can also increase your loved one’s longevity. At Home Care Assistance, we train all of our caregivers in the Balanced Care Method, a program based on studies of elders in Okinawa, Japan, who take a balanced approach to their physical, mental, and emotional health and live longer and happier lives as a result. For more information on elder care Harrisburg seniors and their families can count on, call one of our friendly Care Managers at (717) 540-4663 to request a complimentary in-home consultation.